(L-R): Felling co-owners Bonnie Radjenovich and Brenda Jennissen; U.S. Sen. Amy Klobuchar; Paul Radjenovich, Felling vice president of operations; and Mike Cave, director of production – Litchfield, pose for a photo during Klobuchar’s tour of Felling’s Litchfield facility. 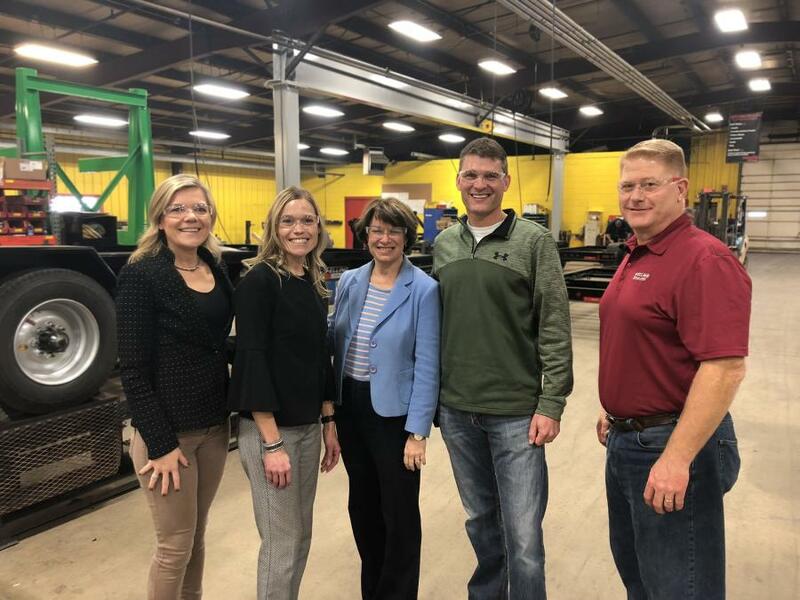 In late October, Felling Trailers Inc.'s Litchfield location became part of the itinerary of Minnesota U.S. Sen. Amy Klobuchar's Central Minnesota Manufacturing road trip. While touring Felling's production facility in Litchfield, Klobuchar spoke with Felling Trailers' ownership and management about issues such as health care and workforce shortages that the company, like many manufacturers, is facing. Co-owner Brenda Jennissen told Klobuchar that between Felling Trailers' Sauk Centre and Litchfield facilities, where it builds custom trailers, it has 275 employees and 20 to 30 openings. "We are a growing company and need a strong workforce to keep pace with the demand for our product," she said. "As a business, we have seen a growing trend of employees that have decided to leave the company to simply work closer to home," said Paul Radjenovich, vice president of operations. "That was eye-opening, and we realized we need to home-grow the skills." Like several manufacturers across the nation, Felling looks to build relationships with area high schools and colleges. "By partnering with educators, we can introduce modern manufacturing to students and expose them to the career opportunities that exist," said Jennissen. Felling invites schools to bring students in to tour its facilities to help them get a better understanding of what a career in manufacturing entails. The tours detail the entire trailer building process from start to finish. Most recently, the Sauk Centre seventh-grade students toured the facility. "They were amazed. They had no idea what was going on in their own backyard," said Jennissen. Felling Trailers Inc. works with local schools to help get the word out to students of the jobs that manufacturing has to offer. Along with offering tours, Felling also offers a selection of student programs: Careers in the Community provides weld training to high school juniors and seniors, Youth Welding Camp provides basic welding safety and training for elementary to junior high ages, and most recently, Felling offered a Women in Welding course all free of charge. Since starting these classes and getting students involved in manufacturing, many have come to work part time while in high school and college to continue gaining experience. During her visit, Klobuchar spoke about the measures being taken at the federal level to strengthen local workforces, specifically the Perkins Bill. "And I think we should be doing more of that, specifically focused on schools that are doing more with offering technical education, making it easier for schools to pair up with community colleges. "We have to be very clear. It's not one size fits all. You can get a college degree while you are working, and you can certainly work on stuff while you're in high school. I think parents have to see the value of these jobs, how much they pay, the advantages of them. And employers are looking at, ‘OK, what can I do to be flexible with schedules? What can I do to get more women in the workforce in manufacturing?' It's no longer the three D's: dark, dirty and dangerous. It's pretty light in there [at Felling]." Felling Trailers is a family owned and operated Full Line Trailer Manufacturer located in Central Minnesota. Started in 1974, Felling Trailers Inc. has grown from a small shop to a factory and office complex that today covers more than 260,000 sq. ft.
For more information, call 800/245-2809, email sales@felling.com or visit www.felling.com. The company can also be followed on Twitter (@FellingTrailers), Facebook (Felling Trailers, Inc.), and Pinterest.